Though it is almost September, the hot and humid days of summer persist. We hope you will all take a moment, however, to brave the heat and stop by the Shirokane gallery to see our latest exhibition. This installment focuses on Japanese ceramics. 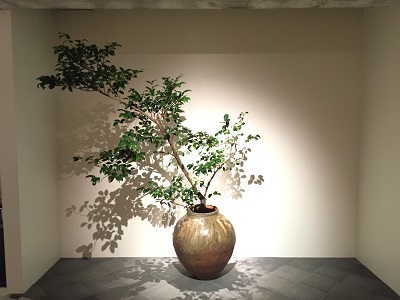 Below, we have placed a large camellia branch in a Muromachi period Echizen ware jar. The lush green leaves of the camellia combine with the outstanding shape and beautiful natural ash glaze of the jar to create a wonderful display. A variety of Japanese ceramics from other periods are also on display, so we hope that you will take the opportunity to stop by and see the show.